A lovely name for detached triple chain stitch. The method of working this stitch is on Queenie’s blog. Working this way gives more dimension to an ordinary detached chain stitch. So I worked the stitch on satin cloth, pattern taken from old pattern book. The flower in two shades of blue with four strands of cotton skein. The stems are worked in outline stitch. The leaves are again worked with mille fleur stitch. Added small pearl beads inside the flowers. This project was completed just before the tailor left for vacation. The worked satin fabric was sewn on the towel by him. The old patterns which have detached chain options can be used for this stitch. Another option is using this stitch with ribbon embroidery. A pretty and easy stitch for textural embroidery. I have started working on 36th week stitch. 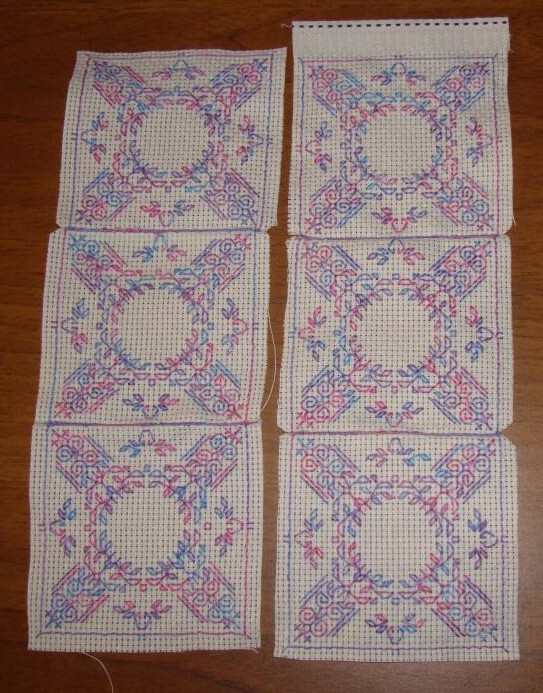 The 37th week stitch of SSS challenge is Hungarian stitch. the working is on Queenie’s blog. I had worked on a long stitch kit from Anchor few years ago. There were three kits of same size with different flowers. This is one of them. The background was also to be worked in long stitch only on all of them. On each of them a needlepoint stitch was worked. In this daffodils piece, Hungarian stitch was worked as back ground in black and maroon. Colour choice was not ideal, but it was okay. 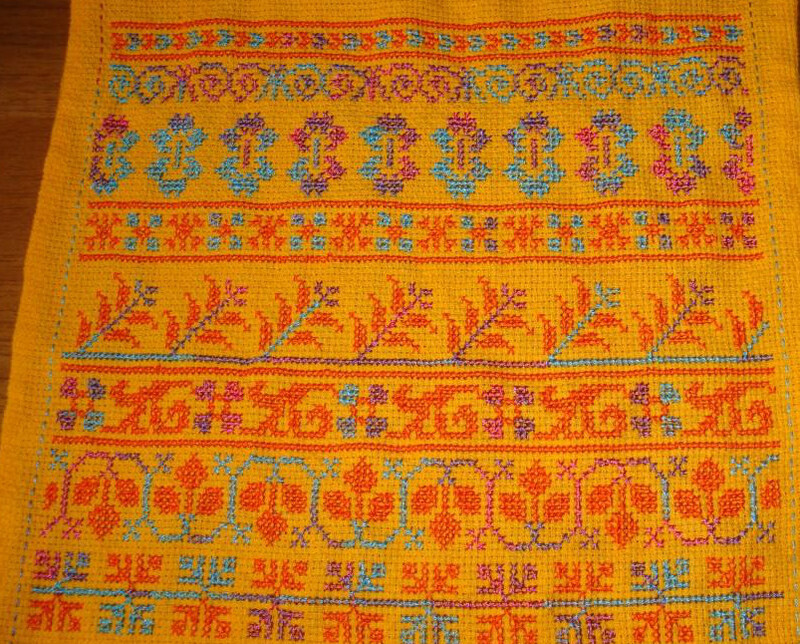 After working the Roumanian stitch as Indian filling stitch, maybe small Hungarian stitch samples can be worked on canvas. The knotted satin stitch of last week on SSS challenge was started on a peacock design on linen fabric. This will take a while to be completed. This week’s stitch on this challenge is lace stitch or three sided stitch on pulled thread embroidery. The samples are to be worked on small area within a frame. It’s started today. Some bands will be taken from this stitch along to work with lace stitch. This week Algerian eye stitch is on TAST challenge. The samples were worked on earlier challenge. The link to the samples on this blog was posted today morning on FB group page. The stitch challenge stitches are taking up most of the time this week. The cross stitch borders were completed on Aida fabric for navy blue polyester linen tunic. This fabric is benarasi georgette in green. Benarasi means a type of weaving on different fabrics. Silk, tussar, cotton, georgette , chiffon, crepe, wool are all woven in this type. It is from Varanasi [in northern India] or Benaras as it is called. An embroidery with stones and zardosi beads will be worked around the neckline on dark green fabric. The design is ready to be traced. I started with the second design. The same square pattern needs to be worked six times to make a cube. This time it is not a cube ornament but a square ornament. The design needs to be worked twice. Saves time too. This is worked on 14 count Aida with anchor cotton skein and variegated fine silk thread. Hope this project is worked during the following week. 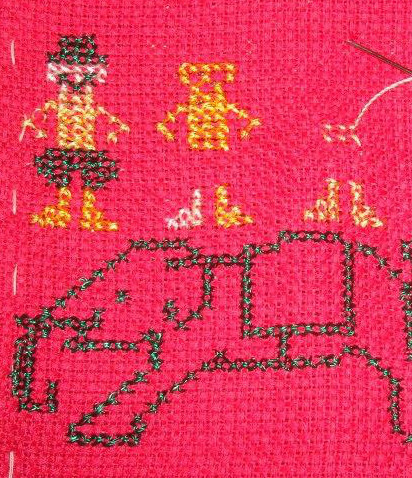 A few more kutch work borders were drawn in the last two evenings for kutch work border designs collection. An idea of working Kashmiri embroidery [chain stitch] on crepe silk fabric is at the searching for the right design stage. Will be happy to start the embroidery on this project next week. I caught a viral infection on Sunday and was quite sick and weak. With antibiotics and paracetamol feeling slightly better today. My husband was also affected by this stupid virus. Now to see the progress made during this last week of this year. The black work pattern by SEBA designs was worked on 18 count Aida cloth with single strand of Anchor skein. This was a Christmas present for a close friend. Pink stones and pearl beads were added as embellishments. The work on the cube ornament on 14 count Aida was resumed after this project. The embroidery was completed. Now these have to be brought into cube shape. First time attempting a cube. Feel quite anxious and excited. Saturday was RPW day. Two different edges this week. Started on these and BLOP! fell sick. They will be resumed next year. Some progress was made during this week on this black work cube ornament on 14 count Aida. Though a fan of Seba designs, this is the first time I am trying one of her patterns. Either this pattern is very intricate or I have difficulty working on it, this is taking quite a bit of time to work. I used Anchor variegated cotton skein. The same design is started on 18 count Aida fabric also. This is for a square ornament. This is more difficult. The earlier weeks randjes were completed. The blog which is running this challenge seems to be well set for 2016. The next year’s challenge is a long sampler including alphabets, which will be posted in parts every week. This project is a cube ornament. 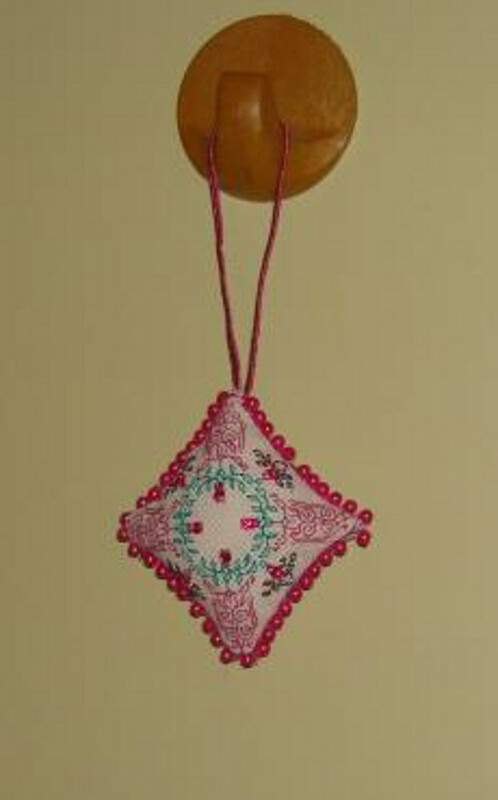 The black work pattern for this ornament is posted on a facebook group. Many people would be familiar with Seba Designs. This is stitch a long. This is my first SAL. Started the outlines with double running stitch. This is done on 14 count Aida.